Serato recently introduced a new plug-in, Pitch N’ Time, that claims to be the best DJ keylock algorithm on the market. Want to slow down a track 40% and keep it in key? It takes a powerful engine to make that happen. Today we investigate how well keylock works in three softwares – read more inside and listen for yourself. The 6% rule in effect – +6% on the left and -6% on the right. In traditional DJing, the ability to adjust tempo and pitch of a track were inextricably connected to each other – speed up a track and the pitch increases accordingly. The 6% Rule was a simple guideline for pre-DAW producers and remixers. If you adjust a song’s tempo by 6%, it’s equal to moving the song one key on a keyboard in the same direction. The technology used in DJing (primarily turntables) meant there was no distinguishing between key and tempo. With the introduction of “Master Tempo” features in DJ equipment and software, this all began to change. 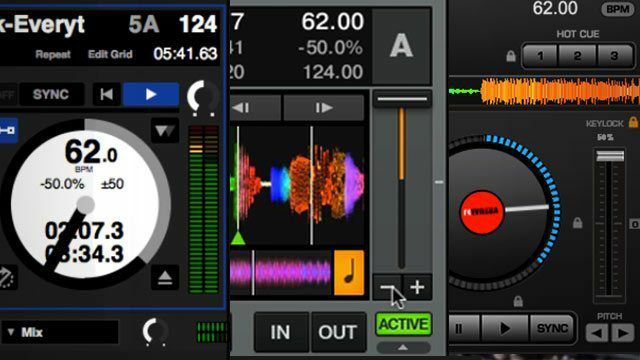 The new function allowed DJs to adjust the BPM of a track without marring the pitch. This came at the cost of audio quality – when a track is slowed down, it’s subjected to time-stretching algorithms and the waveform is sliced up to fill the additional space between beats. This traditionally has meant you hear a lot of audio chopping and artifacts, especially as the key-locked tempo moves out of a 5% range from the original BPM. Many old school DJs argue that most of the features of digital DJ software don’t actually offer anything beyond convenience. Key lock is one of the areas where there simply isn’t anything close to equivalent in a pre-digital world. If you wanted a 20% slower version of a track that kept the original pitch intact, your best bet would have been to commission a new version of the song to be recorded in a studio. In our field testing, we found that Serato’s Pitch ‘N Time DJ was far and away the winner among the major three DJ softwares (as noted in the comments, it is the only algorithm that costs extra – a $29 purchase) After getting used to it, it actually opened up significantly more mixing possibilities. Suddenly it was reasonable to mix in a track that normally would be way out of a equivalent tempo range. In general, Serato Pitch ‘N Time DJ seemed to work the best as a mixing utility to slow down a song. There’s still a “rushed” sense when increasing tempo significantly, making it harder to make space for the track in the mix. Traktor Pro 2 has a clearly defined cutoff point after which the keylock engine drops off a cliff – about +/- 30%. The sound quality make the tracks unusable, and the key no longer holds stable. Virtual DJ 7 continues to show its age in this test – while the key stays locked the whole way through, you start to hear artifacting much faster than either other software. It’s a shame, especially because VDJ has always had more usable features related to key (Camelot code detection built-in and the key field changes when the key knob is adjusted). We’ve heard from Atomix Software that they’re expecting to finally release Virtual DJ 8 this year, so perhaps keylock will see some attention then. We’re interested in doing a few follow up tests of both production keylock tools and less-prominent DJ software, including iOS apps. If you have suggestions for programs and plug-ins to try, let us know in the comments.